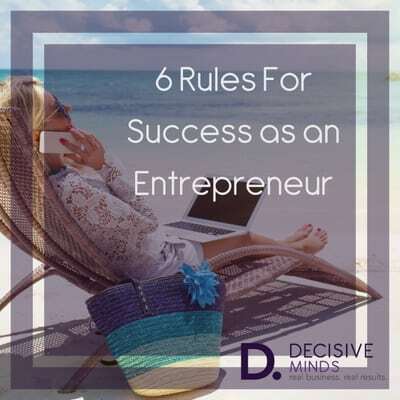 You’ve asked me over and over what the rules are for success as an entrepreneur. As a serial entrepreneur, I’ve given a lot of thought to what makes a business successful. I’ve come up with my super six rules for success as an entrepreneur. This is the first place where entrepreneurs get stuck; but, it shouldn’t be. Everyone is different – so even if there are a dozen other people in your town who do exactly what you do… they won’t do it the same way. You need to know how you are different so you can highlight those differences and attract *your* ideal clients to you. Your perfect clients won’t be happy with someone else. Find your tribe and your business will thrive. If entrepreneurs don’t get tripped up on rule #1 – many get stuck on rule #2. The surest way to add stress to your business is to get stuck in the start-up phase. Set up the fundamentals then move on; don’t become caught up in the “perfectionism” or “analysis paralysis”. There is so much to do in the beginning. Just make a list, get it done and move on. Yes, it will be ugly (I look at some of my old stuff and cringe), but it will work, you’ll grow and your materials will continue to improve. Just do it. If I had $5 for every client who tried a marketing strategy once and then wanted to quit because they didn’t sell anything (even though they got noticed by a whole new crowd), I would be a wealthy woman. The purpose of marketing is to get people to listen to you and to want to connect. The goal of marketing is lead generation. Once you’ve connected, then work on converting. But, give it time. This is closely related to #3. The world is a big scary place. Do you really want to buy from someone you barely know? Nope, I didn’t think so. Building connection and giving value makes people more likely to buy from you over time. Prospects need to know, like, and trust you then they will buy from you. Do you fix your own car? Fill your own teeth? The biggest mistake I see people making is not hiring help soon enough. There are people who live to help you with all the tasks you need in order to create a successful business. Just because you think you can do something – doesn’t mean that you should! (I have a degree in accounting and don’t do my own books). Start with a business coach, then a virtual assistant. It is amazing what a good VA can do in just 10 hours a month (yes, a month, not a week). What is true in the stock market is true in life. The greater the risks the greater the rewards. I’m not advocating doing anything that will put your family in danger – but putting yourself out there and taking small risks (like going to a live event, or putting on your first teleseminar), will reap many rewards in your business. What are you doing to grow your business today?